BANGI, 29 June 2012 – Scientists and architects have to find ways of using other construction materials to replace cement, especially in concrete because cement and its manufacture pollutes the atmosphere with carbon dioxide. A materials researcher at The National University of Malaysia (UKM), Prof Dr Muhammad Fauzi Mohd Zain a lecturer with the Department of Architecture, Faculty of Engineering and Built Environment said production of Portland cement not only releases 7% of the World’s carbon dioxide, the cement industry also uses a lot of natural resources such as limestone, clay, pertroleum, coal and other substances. Giving his inaugural lecture on Zero Cement Architecture here today, he said many historic buildings have stood for years without the use of cement. Prof Fauzi suggested the country’s construction industry aid researchers identify suitable replacements or alternatives for Portland cement in concrete. There were efforts before to partially replace cement in concrete with new compounds dubbed ‘supplementary cementitious materials’ (SCMs). Among the SCMs experimented with were pozzolan and rice husk ash (RHA). Pozzolan exhibits cementitious properties when combined with calcium hydroxide. Pozzolans are commonly used as an addition to Portland cement concrete mixtures to increase the long-term strength and other properties of Portland cement concrete. Pozzolans usually contain silica dioxide and aluminium trioxide. On its own Pozzolan is still too costly for concrete and is usually mixed with cement. RHA is basically ash from the incineration process of rice wastes, usually the shell. RHA has the physical and chemical properties of minerals. However, the process needs a lot of heat in extended times and is still too expensive and cannot completely replace Portland cement. Research on RHA is ongoing. Prof Fauzi said various experiments on the use of the alternatives had succesfully been carried out at UKM since 1996, resulting in partially substituting cement with SCMs which produced high quality concrete. And with environmental issues becoming a major concern, research on the production of sustainable concrete and so-called green concrete had also been done. Studies on producing concrete with zero cement is ongoing since 2009. While it is still difficult to adopt a concept of architecture with zero cement in the near future because most of the world’s construction work is very much dependant on the use of cement, the technology and the potential to bring the concept to reality is improving, he said. Prof Fauzi said construction designs inspired by biomimetics and artificial photosynthesis may also be applied to Zero Cement Construction. Biomimetics or Biomimicry is the study of the structure and function of biological systems as models for the design and engineering of materials and machines. In simple term, it means copying nature to build structures, such as buildings in the shape of bee-hives or ant-hills to get the best air circulation. Photosynthesis is the process in which plants produce starch or sugar from carbon dioxide and releasing oxygen. In man-made terms, there are some rare metals such as ruithenium which when reacting with carbon dioxide in the air, will release oxygen, thus being eco-friendly. This concept is still in the very early stage and too costly to be practical for now. 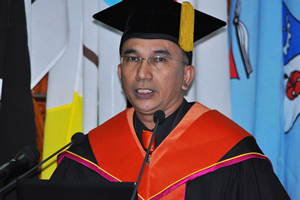 Prof Fauzi suggested UKM offer a mechanism to stimulate research across biomimetiks and artificial photosynthesis. He said to achieve this UKM has to stress on funding for scientific pioneers that is researchers working on the frontiers. He suggested the setting up of multi diciplined research and development teams instead of merely having researchers from the same institute or faculty working together. He said it is important for each expert in one field to give and receive inputs from researchers with different backgrounds. This makes sense because research is a multi-disciplinary affair. 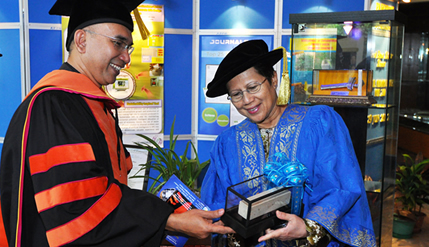 Prof Fauzi is the Chairman of UKM’s Advanced Engineering Centre. He graduated from Institute Teknologi MARA with a Diploma of Building and later went to South Korea’s Kook Min University where he graduated with a Bachelor’s Degree in Engineering. He completed his Masters at Kyushu University in Japan and later received his doctorate from the same university in 1996.